On World Water Day 2019, IIASA researcher Barbara Willaarts tells us more about how our dietary choices can contribute towards reaching the UN’s Sustainable Development Goal 6: Water for all by 2030. The theme chosen for World Water Day 2019 is “Leaving no one behind”. As the UN emphasizes, this year is very much about reminding ourselves that there are still considerable efforts required to provide clean water, sanitation, and hygiene for all people across the globe. While there is no question about the fact that we should push our governments and decision makers to pursue the fundamental human right of access to clean water, bringing forward the sustainable development water agenda – specifically Sustainable Development Goal (SDG) 6 : Water for all by 2030 – requires that action is taken on multiple fronts. Securing access and sanitation, is a top priority, but how we manage the water we have access to, is also fundamental. The first key message here is that a lot of the actions that are required to overcome many of the global water challenges like water scarcity, pollution, and ecosystem degradation, actually do not require expensive government interventions. Many rely on us, on the choices that we make as citizens and consumers in our day-to-day activities. What we wear, how we eat, or what we buy and where we buy it, are daily personal decisions, and these can make a huge difference when it comes to achieving the sustainable development agenda and in particular, SDG6. In the past years I have conducted various research projects looking into the footprints of our lifestyles, particularly in western societies. The aim behind these investigations was not only to quantify impacts to raise awareness, but also to use this information to define benchmarks for sustainable consumption. Being Dutch, it is not strange that I have developed my professional career in the water sector, and living in Spain (the most arid country in the EU) for many years has only deepened my interest in looking into drivers of and solutions to global water scarcity. Anyone working in this field will quickly agree that exploring solutions to water scarcity problems very often implies looking at solutions related to the way we produce and consume agricultural products. There is a bunch of interesting literature out there assessing solutions to increase the efficiency of agricultural production systems and pathways to reduce its environmental footprint. Approaching the food problem from a consumption perspective, however, is an arena that researchers only recently started to explore. This is promising because, firstly, the benefits of improving consumption patterns might outweigh those achieved through efficiency gains. Secondly, this science often conveys messages that are easy to grasp and implement, for example, eat meat only once a week, buy local, and eat five a day of vegetables and fruits. Lastly, it also empowers citizens as the main actors of the social change that is required to meet the sustainability agenda. With that said, I would like to reflect on a recent study led by colleagues from the Polytechnic University of Madrid and the Food and Agricultural Organization, that I was involved in. The research in question is about the water and nutritional implications of shifting diets, and we used Spain as a case study. The choice of the case study was driven by the fact that Spain, like other Mediterranean countries, is often recognized and valued for its fresh, locally grown, and healthy diets. The reality is however that, while it has been so for many years, things across the Mediterranean, and particularly in Spain, have changed substantially after the 70s as a result of a number of drivers including increasing migration to cities, incorporation of more women into the labor force, work-life imbalance, and food trade openness. According to the results of our study, the dietary shift in Spain is such that current diets resemble an inverted food pyramid, with households eating 15% more meat, beverages, and sugar products and 37% less fruits and vegetables on a daily basis than what is actually recommended by the Mediterranean dietary guidelines. The effect of this shift is that today, Spain ranks fifth in the EU of countries with the highest prevalence of obesity and overweight. These dietary shifts have all sorts of nutritional and environmental implications. 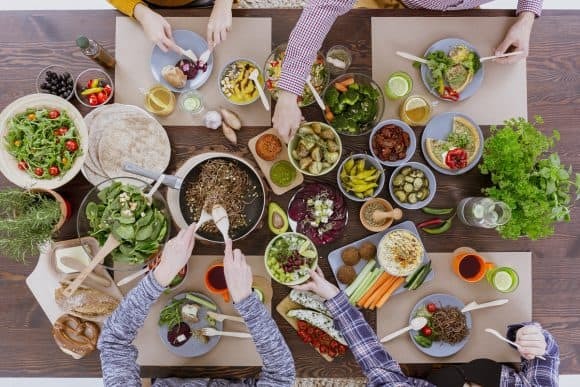 From a nutritional perspective, current diets contain 17% more kilocalories (Kcal) – meaning units of energy – than the recommended intake, as well as a 36% higher content of macro-nutrients like fats and proteins. On the other extreme, the intake of essential micro-nutrients like vitamins and minerals has decreased sharply by 40%. From a water perspective, the observed dietary shifts have increased the water footprint of food consumption by 34%, which is equivalent to seven times the daily per capita consumption of domestic water. An interesting finding here is that current dietary patterns are not just more water intense, but also more international, since over 40% of water “eaten” is from imported food products. This basically means that the Spanish food basket is no longer local but is increasingly being filled with foreign land, biodiversity, and water resources. Spain is not a unique case and it is very likely that similar trends are occurring across other European and developed countries. This clearly evidences that what we eat matters a lot – to our health and to our environment. Most importantly, you and I have the capacity to make the difference. Eat healthy, eat sustainably, and don’t leave yourself behind! Blas A, Garrido A, Unver O, & Willaarts B (2019). 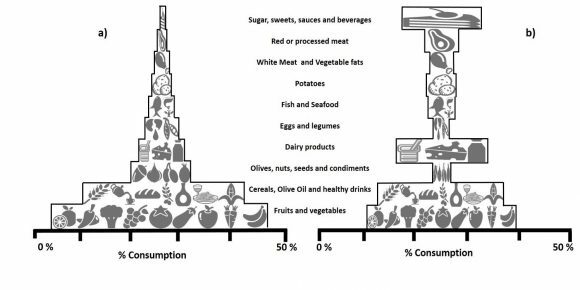 A comparison of the Mediterranean diet and current food consumption patterns in Spain from a nutritional and water perspective. Science of the Total Environment 664: 1020-1029.